Here at Clear View we have over ten years of experience in delivering high-quality folding door and window solutions to customers across Yorkshire and the UK. 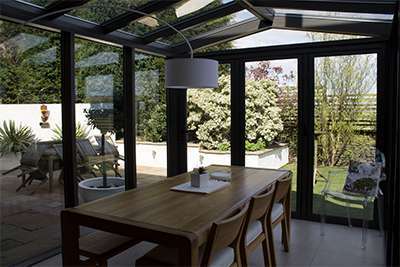 We have come to realise that our customers are particularly impressed with their new sliding and bi-folding patio doors. These doors don’t only transform the look of your home, but they also change the way you live in it. Our patio doors really bring the outside in, as you can sit back and enjoy your garden views from a downstairs living space or even bedroom. They also seamlessly link parts of your property together – it allows your family and guests to meander socially between the patio and kitchen areas. Installing patio doors is a fantastic way to bring natural light into an otherwise dark room. As well as some stunning aesthetic advantages, this is economically very advantageous – you can potentially save hugely on energy bills. To give you the best option possible for your home, Clear View install both sliding and bi-folding patio doors. Our sliding doors, for example, are ideal for a small balcony area where you need to be smarter with your space. If you have great scenery from your patio, sliding doors also give you an entirely unobstructed view. It’s easy to get caught up in how stylish our patio doors look, but fear not, they are completely safe and secure. Our multi-point locking systems provide fantastic protection from break-ins, and ensure a burglar resistance of up to EN V 1627 Class 2. They are also made to measure your door frame perfectly, ensuring that they tightly fit the seal for a snug fit. If you would like to hear some other benefits or are interested in our range of patio doors, don’t hesitate to contact us on 0800 135 7167.